I caught this Red Squirrel red handed invading one of my bird feeders. This little guy has a home further back on my Caledon property but occasionally comes around to raid the bird feeds. Red Squirrel's actually known as the American Red Squirrel is one of two species of tree squirrel currently classified in the genus Tamiasciurus and known as pine squirrels. It is a medium sized (200–250 g) diurnal mammal that defends a year-round exclusive territory. The diet of these tree squirrels is specialized on the seeds of conifer cones. As such, they are widely distributed across North America wherever conifers are common, except on the Pacific coasts where they are replaced by Douglas Squirrels. Recently, American Red Squirrels have been expanding their range to include primarily hardwood areas. 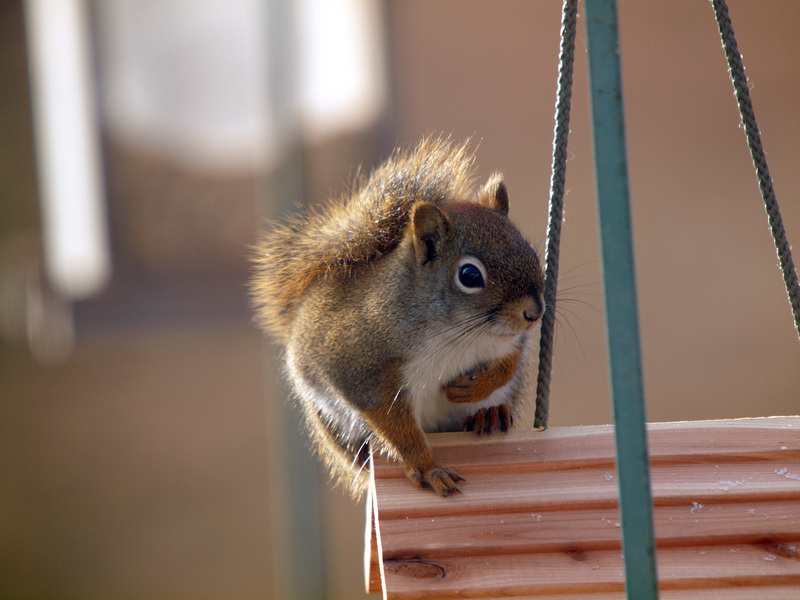 For more info on the American Red Squirrel click here. I took this picture with my new zoom lens I recently bought, a Sigma 50-500mm lens which is actually 1000mm max focal length equivilant under the 35mm film standard. For a larger picture click on the image above. Posted: November 21st, 2010 under Caledon, Photos, Wildlife. First up, that must be a great camera. As a bird lover, squirrels are a complete and utter pest. There are a number of ways of defeating these little chaps and keeping them away from the feeders. You can buy special ones and you can also make your own.